Vertically integrated Yingli Green Energy, once the largest solar module manufacturer in the world, has been on the precipice of financial disaster for years. Burdened with debt, the company finally saw its shares delisted from the New York Stock Exchange this week and relocated to the far less respectable OTC Pink Sheets. The Chinese solar major was removed from the exchange for not maintaining an average global market capitalization of at least $50 million over a consecutive 30 trading-day period. It's not a huge surprise — Yingli has been in a slow motion financial crash since 2015, brought on by a massive debt load and the bad timing of its capacity investments. Yingli ended 2015 with debt close to $2 billion, a situation brought on by its decision to expand capacity when solar module prices and demand were both low. Yingli reported a 2017 loss of $510 million and a cash position of just $58.1 million, with total revenue of $1.28 billion on PV module shipments of 2,953 megawatts. Yingli was the world's top module supplier in 2012 and 2013, a perch akin to holding the drum seat in Spinal Tap. Sharp, Q-Cells and Suntech have also worn that crown. The last decade saw a wave of Chinese solar firms listing and raising money on American exchanges — with mixed results. One-time market leader Suntech America went bankrupt in 2013. Now, the goal for Chinese manufacturers seems to be getting off American exchanges. Trina Solar, another China-based vertically integrated solar module manufacturer, went public on the NYSE in 2006 and then went private in 2016. Investment bank UBS has suggested that "undercutting prices to gain brand recognition/share has shown to be the downfall of module manufacturers" looking to be the leading global supplier of this pernicious commodity. Yingli’s woes are less an indicator of widespread problems at Chinese panel manufacturers and more about Yingli's self-inflicted debt wounds in choosing to produce its own polysilicon in a factory with low utilization, not to mention its continued sponsorship of the World Cup. While Jinko, Trina and Canadian Solar have benefited from global demand growth over the last few years, Yingli has focused attention on its financial woes. 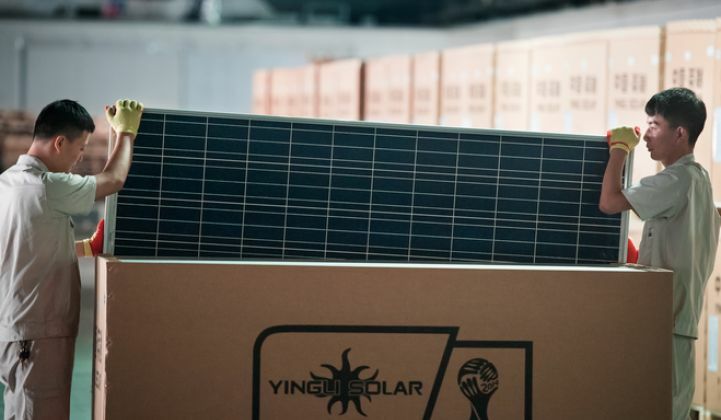 "​Yingli's stock never recovered after its first delisting. Since serious concerns regarding the company's liquidity were never adequately addressed, it was unlikely that it would pique investor interest. The current supply glut will likely hit Yingli the hardest, as buyers flock to more bankable companies offering competitive pricing," said Jade Jones, a senior analyst at GTM Research.